the end the 24-120mm proved more than adequate and I used it 99% of the time. I also carried a tripod, which is an absolute necessity for long exposures that are almost guaranteed inside dense forests with an ISO 50 film. 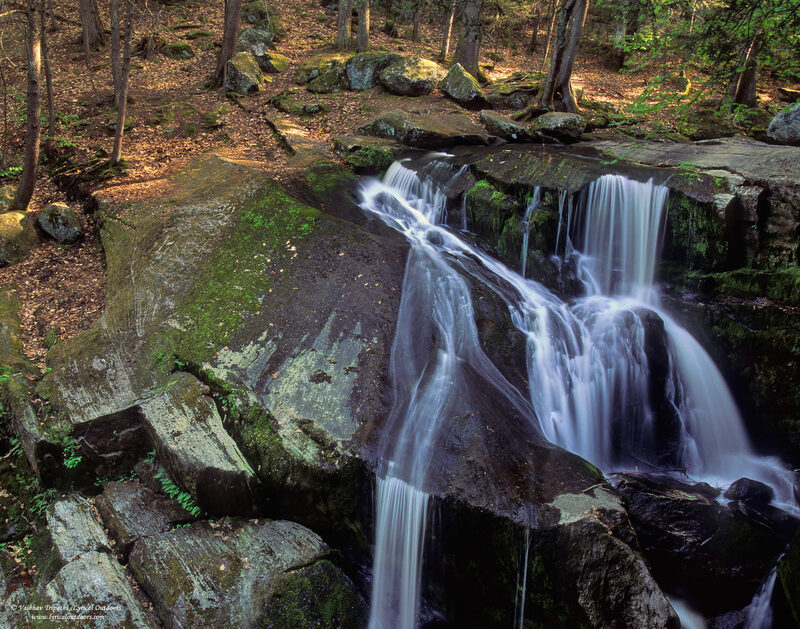 We started with Pitcher Falls, a 12 feet punchbowl about two hours west of Boston. A quick 20 min hike took us to a cascade and then 5 minutes further downstream to the Pitcher Falls. Instead of scrambling to the base of the waterfalls, I decided to make photographs with a high vantage point to capture the lovely forest in the background. The conditions were near ideal cloudy skies (soft even lighting) and no wind. 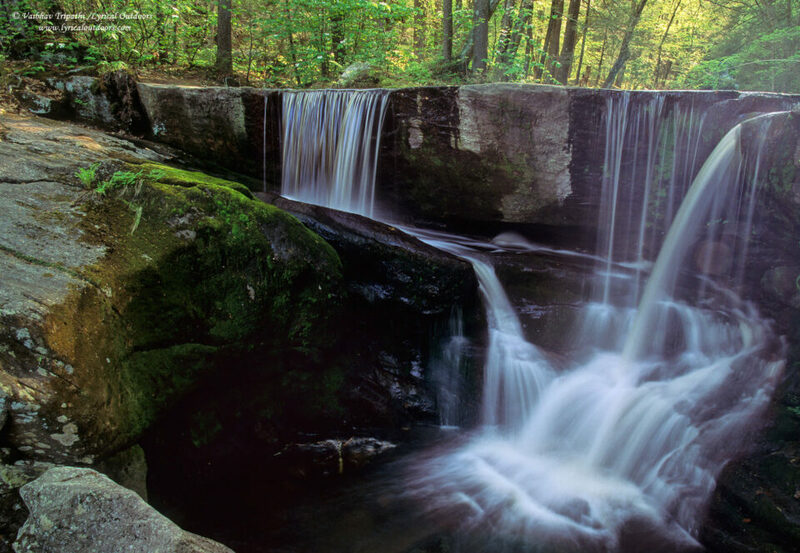 Next, we visited Goldmine Brook Falls situated in the Chester-Blandford State Forest in the town of Chester, Massachusetts. 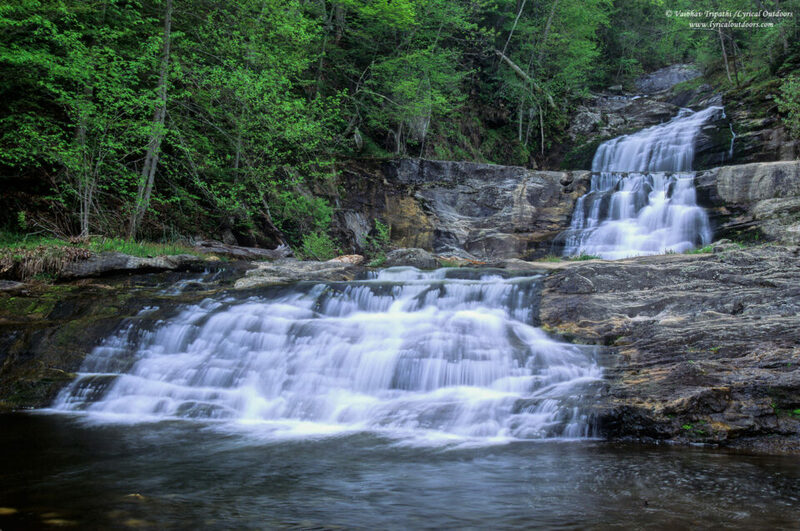 This picturesque waterfall is only about 0.1 mile hike/scramble from the road and can be easily missed. I took time to set my composition and waited for a little cloud to fly over the mid-day sun- the light was soft momentarily, colors came live again and I tripped the shutter. 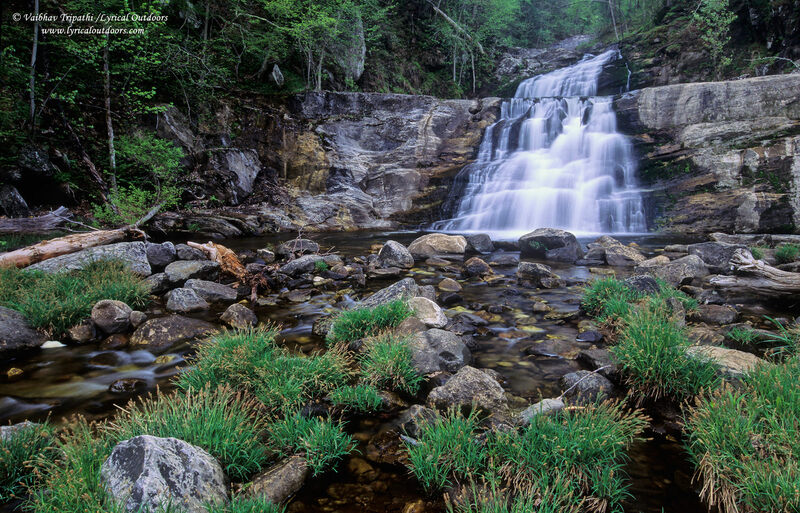 After Goldmine brook falls, we made a quick stop at the nearby Sanderson Brook Falls and then drove to Mt. Everett State Reservation in western Massachusetts. 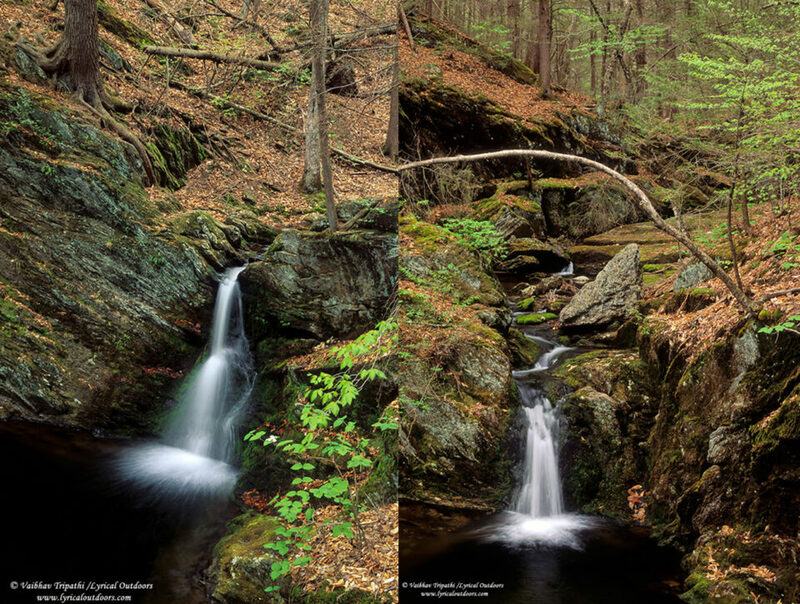 Here the beautiful Race Brook forms 5 waterfalls and the place is a joy to explore and photograph. The trails are a bit steep and tricky though, and it’s easy to lose directions (we took wrong trails twice). 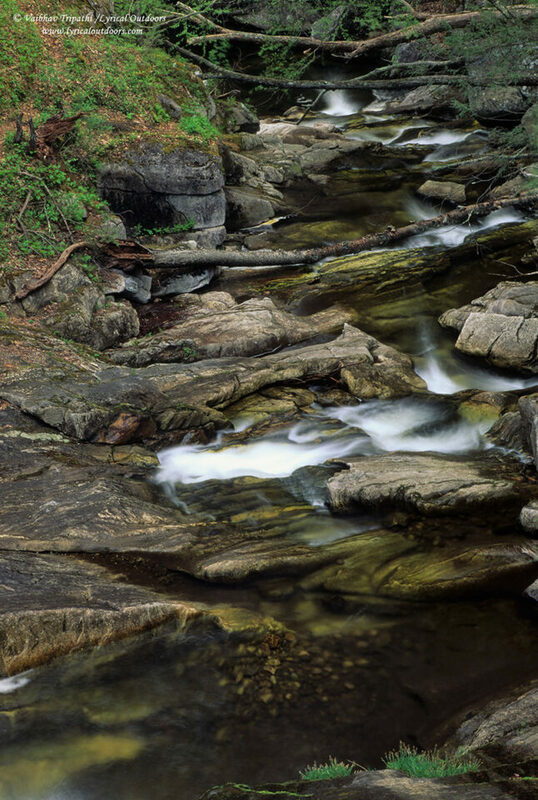 By the time we reached the base of second Race Brook Falls, it was late afternoon and the cloud cover had returned. Once again, I had near ideal conditions to photograph. Scrambling further up brought us to a series of cascades. 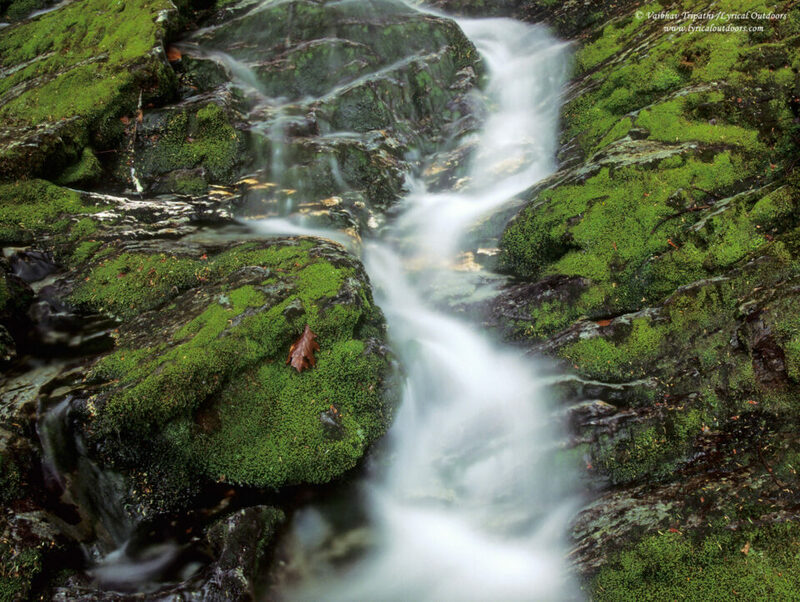 The moss here was really green and I took advantage of the soft light to capture the color juxtaposed with silky water. 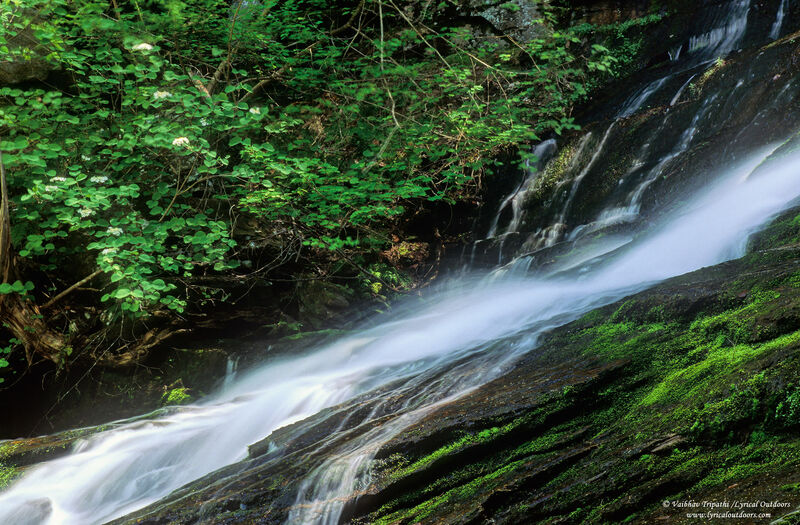 height, a new tier of tumbling water is revealed, each as picturesque as the other. 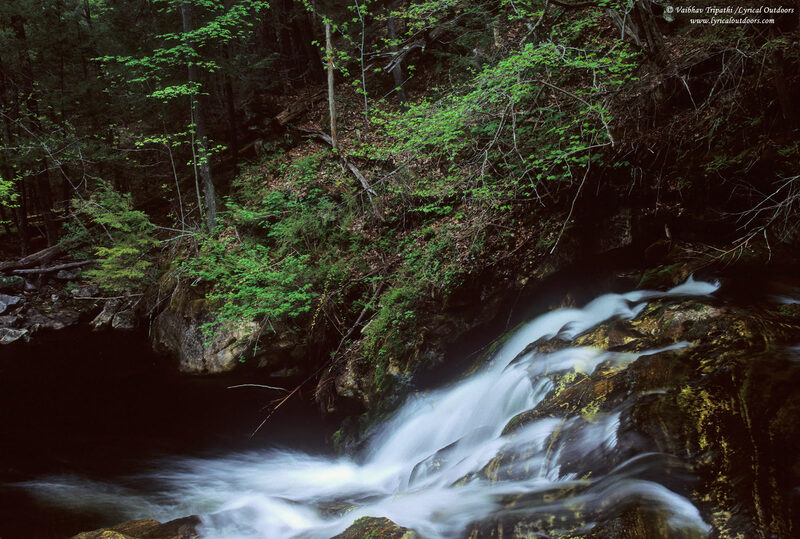 Finally at the top, you can appreciate a bird’s eye view of the Kent Falls Brook. 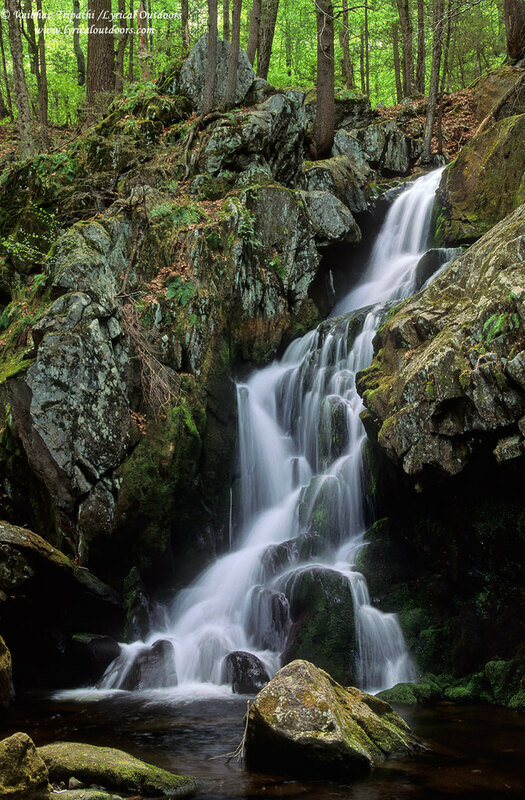 Our next stop was Dean’s Ravine Falls, which is about 40 minutes north of Kent Falls, near the town of Cannan in Connecticut. With the light not being as cooperative as the day before (harsh mid-day sun), I switched to isolating few areas that were in shade. Same was true at Campbell Falls in Campbell Falls State Park at the border of Massachusetts and Connecticut (our next pit stop). 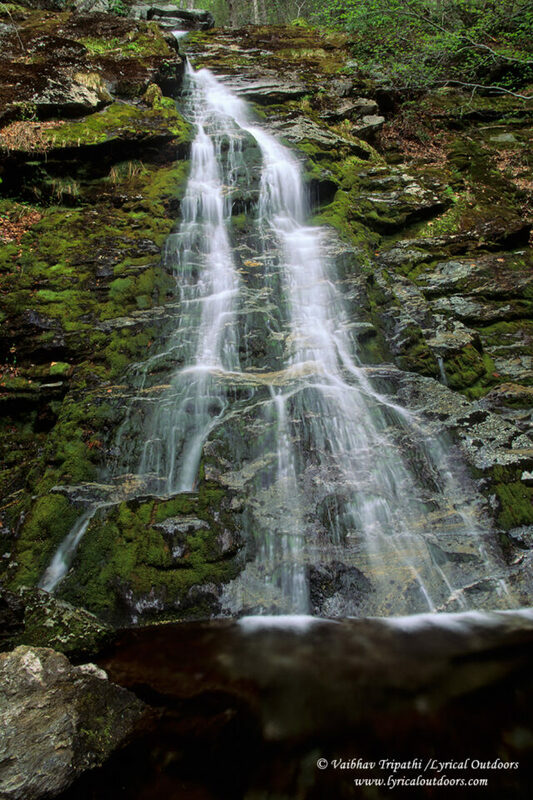 The final destination in our itinerary, before heading back to Boston was the Enders State Forest in Connecticut, which houses an exceptional collection of five diverse waterfalls collectively referred to as the Enders Falls. It was a hot afternoon, the lighting was harsh and on top of that the area was full of people – not so good for waterfall photography, but we endured. As time progressed, the number of people steadily reduced as well as the light kept getting better for one waterfall after another. First, I photographed the not so remarkable second Enders Falls and then the fourth. Eventually, the light was just right to photograph the third Enders Falls with the composition I had envisioned while waiting earlier – easily one of my favorite images from the trip. Overall, it was a great satisfaction to photograph something relatively less known. We enjoyed the driving/hiking/exploring over the weekend so much that we did a repeat trip the next weekend, this time focused solely on western Massachusetts. I still do not have developed film from this second excursion but stay tuned for part II.